We’ve reviewed Oddka Wasabi Vodka – a bizarre little bit of booze that has a strong wasabi flavor without the “oh my god, I’m going to die” of trying to drink actual wasabi. We’re taking some of the recipes that Oddka recommends and switching them up a bit to our own tastes. As the vodka is sweeter than you would expect, that gives us some more leeway while mixing with sweet and savory than a straight up spicy vodka would. 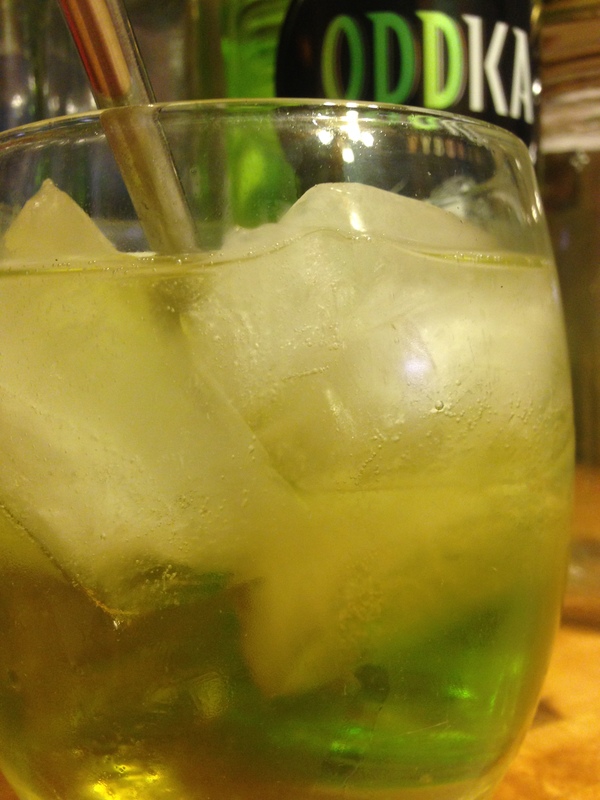 Build the drink in a rocks glass filled with cubed ice. The citrus and spice of the two bitters compliments the bite of the wasabi vodka, and the ginger ale adds a pleasant effervescence to the whole affair. Just be aware that the green of the vodka can make for some funky colors as you mix.